West Fairlee, Vermont is a quiet scenic town located between the Connecticut River and the Green Mountains. Once an agricultural town, this sleepy community is now mostly home to commuters. It's idyllic location makes for splendid year-round recreational opportunities. Learn more about West Fairlee! 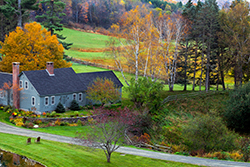 Scroll down to find all current real estate for sale in West Fairlee, VT. Contact us if you have questions or would like to learn more about a listing. Sign up to save your favorite listings and email updates when similar listings hit the market.